Students gained exposure to career opportunities in the construction industry through interactive activities run by thirty different construction and skilled trades companies. Students experienced activities such as: working in a mock demolition room, building a wooden Adirondack chair, assembling an air duct, following plans for electrical lines to make a light bulb light up and more. 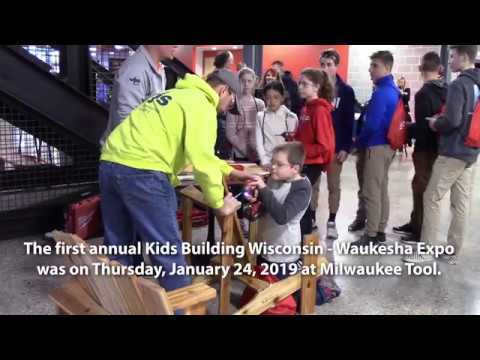 Kids Building Wisconsin is a nonprofit organization that has hosted this event in Madison for the past five years. 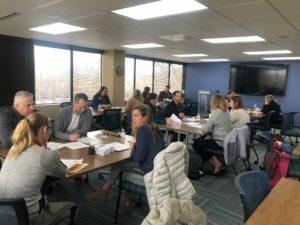 This is the organization’s first program in Waukesha County. The construction/skilled trades industry was hit particularly hard in terms of labor during the Great Recession, and its workforce is not bouncing back as quickly as other industries. The lack of labor drives up construction costs, which in turn raises the prices of homes, commercial buildings, repair services and more. The Alliance is working to show middle school students that the construction/skilled trades industry has many fulfilling, stable, high-paying jobs to consider. Thank you to Milwaukee Tool, Price Erecting, The STARR Group, VJS Construction, Jens Construction, Johnson Financial Group, Plumbing Mechanical and Sheet Metal Contractors Alliance, Tim O’Brien Homes and Waukesha County Technical College, who provided funds to offset the costs for school districts to bus students to the expo. Click here to see coverage from Fox6 News.